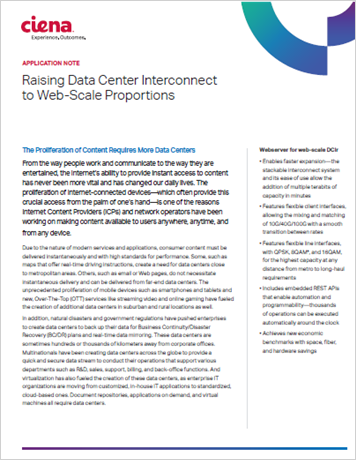 The requirements of the new web-scale operational paradigm can only be met by introducing DCI solutions that are built for web-scale operations from the ground up. Ciena’s Waveserver offers new features, capabilities, tools, and functions that help DCI applications respond to the global shift to web-scale connectivity. By leveraging Ciena’s state-of-the-art WaveLogic 3 Extreme chipset, Waveserver offers high capacity in an extremely compact footprint, with a web-scale operations toolkit and open programmability—all the essential ingredients to help DCI compete in the web-scale era.